7 Easy Steps to Make your Chinese Raffle a Hit! Chinese Raffles are a terrific way to fundraise for your charity, school, club, church, or community organization. When you know how to run one of these raffles, you have the potential to raise a lot of money for your cause. They’re one of the most dynamic ways to organize a raffle, and they’re a lot of fun for participants. More fun can equal more lucrative fundraising results, which creates a definite win:win situation for organizers and participants alike. Many people also refer to this type of raffle as a Chinese auction, basket auction, penny (or nickel, or quarter) auction. It’s a fundraising event in which participants purchase small tickets that they can submit to win a variety of prizes. How does a Chinese Raffle work? The basic concept has two parts: the “auction” phase and the “raffle” phase. The raffle organizers seek out donations for prizes for the auction. At the time of the event, the prizes are put on display on tables for guests to peruse. In front of each prize is a designated basket, bowl, box, or some sort of vessel to hold the tickets for each prize. During the auction phase, participants purchase sheets of tickets and each ticket is used as a “bid” for a chance to win the items of their choosing. They place however many tickets they would like in the baskets that correspond with the prizes they would like to try to win. This is fun for participants because they have a lot of choice in how they can spend their tickets. Participants may increase their chance of winning by bidding more tickets on one specific item. If someone really wants to win one particular prize, they might put most or all of their tickets in that lot to try to win that prize, or they could spread their tickets out among all of the prizes. At the conclusion of bidding, a raffle is held to draw the winners. The raffle stage is really like a series of raffles. One winning ticket is drawn for each raffle item. The more tickets a person deposits into each basket, the higher their chance will be to win the item. Participants who bought a lot of tickets and bid on several items might win many times. It can be fun to create a ceremony for the draw and to make the announcements publicly, or you can contact the winners after the event if they’re no longer present. Part of the draw for a Chinese Raffle is that ticket costs are quite low per ticket and, if you’ve been able to round up desirable prizes, lucky winners can get a great deal. The more desirable your prizes, the more heated the bidding will become. It’s an amusing and fruitful process! Raffle tickets, like our 25 chip and the 20 chip DIY Chinese Auction/Raffle Tickets. Order 100 minimum tickets that can be customized with your logo or image. You can also sell tickets for an entrance fee with a door prize, particularly if your event will include other entertainment or attractions. About 4-6 volunteers are ideal, or more if you plan to hold a very large event. Have your volunteers reach out to their networks to request prizes for the auction. Prizes might come from members of the organization in question, local businesses, supporters, friends and family members. Consider offering businesses and organizations advertising space in your event program if you have one, or list their sponsorship on your website and on social media. Prizes might be physical prizes, or gift certificates for different kinds of experiences. Also request contributions for refreshments that you can offer at your event as part of the incentive for having people attend. If you’re charging an admission price, include a snack and beverage in the cost of the ticket, or you could offer a cash snack bar. Reach out to a local caterer to see if they might discount their services or an ‘in kind’ donation of sponsorship in the form of food. Plan to print programs for the event that include recognition and thanks to sponsors, donors, and volunteers. You can also sell advertising spots in the program, and be sure to include a list of items being auctioned to entice participants and excite them about the bidding process. This is, perhaps, the most important step in the process. The success of your event will depend on the number of people in attendance and the quantity of tickets that they purchase. Advertise your event on social media, on your website if you have one, on community boards, and with posters (link) in your community. Check your area for free or inexpensive event calendars that you can post in. Make sure to get your entire volunteer team on board so that they can help to promote the event with their networks and build interest and excitement for the cause. Arrange large prizes on display alone and group smaller donations into prize baskets. Bundling items together can create additional appeal for those prizes and often raises more money than a small item would individually. 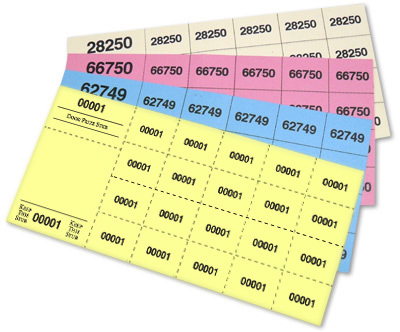 Assign a number to each prize and consider providing a sheet with a description to display with each prize. Prepare a small bowl, box, or basket to go with the prize that will hold the raffle tickets for that item and include the appropriate corresponding number. A brown paper bag can also work well. Prepare your ticket bundles in advance and price your tickets in bundles of 25, 50, or 100 tickets. Have a cash float on hand and try to set out easy prices that will allow for quick sales. Prepare a ticket table at the door to sell the raffle tickets. If your event will include an admission ticket, you can sell and collect this too. If you sell an admission ticket, use the stubs to conduct a draw for a door prize. Allow attendees plenty of time to buy their tickets, evaluate the prizes, and place their bids. Depending on the nature of your event, you might allow an hour, or the bidding might go on all day if the raffle is part of a larger festival. When the time comes to conduct the draw, shake up the tickets in each basket, box, or bag and draw one ticket out of each. If you plan to conduct live announcements, this can be a very exciting and fun time for attendees to witness the draw and cheer on the winners. If you’re also awarding door prizes, pause part way through the Chinese Raffle to draw for the door prize, then resume drawing the prizes. Follow these 7 steps for your next Chinese raffle and your fundraiser is sure to be a success. The more prizes that you’re able to collect, and the more people that you have in attendance creates a recipe for financial success for your cause. Best of luck, and don’t hesitate to contact us if you have any questions.